So I took all of your ideas into account and gray and green were about half and half. So what did I choose? I went with gray mixed with a bit of dark purple. The fabric is still pretty light as I didn't want it to overwhelm the darkness of the pattern. And I thought the purple will pull out the purple of the pattern and the gray will pull out the black lace on her shoulder and in the bottom of her dress. I was going for a storm cloudy look. 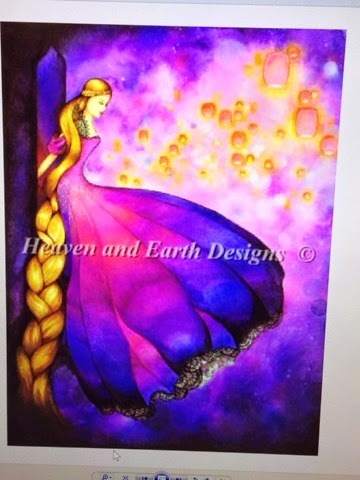 Since Rapunzel still has long hair I wanted the background to reflect that. She hasn't been rescued yet and is stuck in her tower which is kind'be the storm before her happy ending. Made sense to me lol. I thank you guys for all of your input it made the decision easier! I'm really fighting gridding my fabric now because I need to finish paradise! Love the fabric color Heather. I'm thinking about it but I really want to get Paradise done for my cousin. I'm almost done with the top row orange and the next page should see the sun or at least the sky above it but I'm finally getting some different colors in the part I'm stitching now. I get my first new color next! That's a beautiful fabric for your lovely chart. Gorgeous! Can't wait to watch your progress. Lovely colour:) Looking forward to seeing your progress! Fabric turned out to be a great color! Fantastic fabric for a lovely chart. What a colourful design! Wow, I hadn't seen this pattern before, she is going to look amazing on that fabric! Yay, your fabric looks wonderful and stormy! 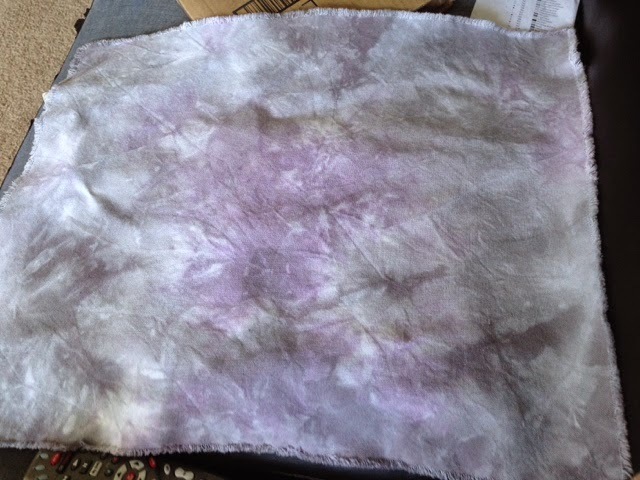 :D Dyeing fabric seems like it would be fun although knowing me, a big mess waiting to happen. You did a very nice fabric color;) , I know how tempting it is to start, she's such a beauty!